Friends came over to spend the afternoon with us, and they brought a big packet of yummy cheesy corn chips. I emptied the packet into a large plastic mixing bowl that I quickly grabbed from the cupboard, and I put it in the middle of the table for five or so adults to share. He grabs a handful of chips and runs off to play with the other kids…. leaving all the adults in silence. So I’m left to explain exactly why he said that. Thanks buddy! And of course, the answer is obvious. Just three days before, that same boy had been ill with a tummy virus, and I had quickly grabbed the same bowl from the same cupboard for him to throw up into when he shouted… “MUUUUM I’M GOING TO VOMIT!!”. And boy, did he throw up! 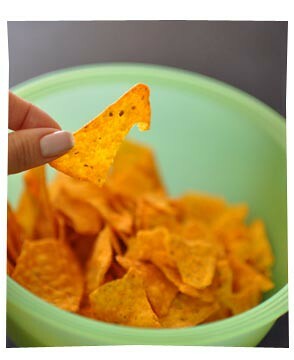 Despite my reassurances that it had been thoroughly washed and sterilised, people were very slow to eat the corn chips. And everything would have been just fine if kids weren’t so honest! « What have you bought from ASOS?